Two factors can be attributed to the deluge of affordable smartphones that are now being enjoyed by the masses. First, the Android OS encouraged the delivery of many variations of mobile devices—from high-end branded products, mid-range, to the affordable ones. Add to this the coming of handset makers whose products really target the lower-income segment, who doesn’t care about brand name but needs a functioning phone. After the deluge, one trend seems certain to happen: these device makers, whose products are mostly made in global factories in China or India, are now bent on improving their products, both from inside and the outside, with enough spec, bells and whistles to even compete with the branded high-end ones. Currently, the Alcatel One Touch Idol Ultra and the Alcatel One Touch Scribe HD are the first smartphones in this category to offer a sort of “high-end” feel and experience, particularly the build and the materials that went into producing the products. With a crisp bright 4.7 inch HD AMOLED touch display (720 x 1280 pixels) and a mere 6.45 mm thin, the One Touch Idol Ultra appears stunning and elegant in black velvety chassis. This phone isn’t limited to the black color as there variants coming in colors Red, Flash Yellow, Turquoise, Green, and Fresh Rose. It comes equipped with an 8 megapixel camera and capable to throw in the needed processing punches with a dual-core ARMv7 processor clocked at 1.2 Ghz. This Jellybean device accepts only micro SIM card and there’s only a single slot for it, which is a rarity as many Alcatel phones feature dual SIM slots. Overall on the physical description, the One Touch Idol Ultra can literally astound—the hold and feel is great, the screen size is just perfect for browsing or reading on the HD AMOLED display. There are only two physical buttons—the volume rocker on the left of the device and the start button on top left. 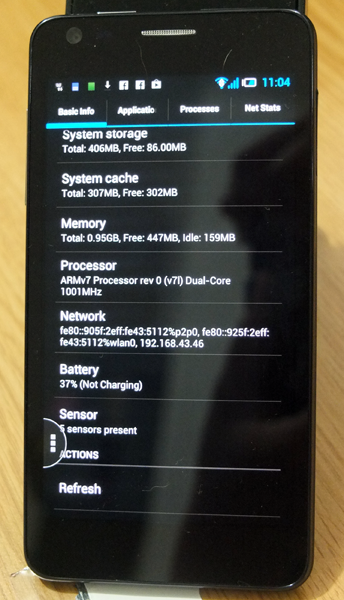 The rest of the Android functions are done onscreen. One key feature that’s obviously missing is the 3.5 mm headphones jack, which was sacrificed to make the phone super skinny. You can, however, attach a headphone through a micro USB adaptor that comes with the device. Another annoying distraction from its physical build is the presence of black rubber covers for the micro USB port (on top) and the micro SIM card slot (on the right side). It’s a real effort removing them. The 1800 mAh capacity battery, which provides the device with 400 hours standby time, is built-in already as well as storage in the ergonomically designed unibody chassis. You cannot pry open the device and access stuff inside. Total storage is hefty at 16 GB, more than enough and one reason why the One Touch Idol Ultra is already peppered with a number of apps, most are useful and fun. It’s got barcode scanner, evernote, office suite, shopping list, internet radio, media share (DLNA sharing), movie studio, manager to sync with PC via Wifi or cable, cloud backup, sound recorder, Gameloft games, skype, video player, PicSay, etc. Of course, you can download many of them from the Play Store, but when they come preinstalled in the device, that sure is a plus factor. 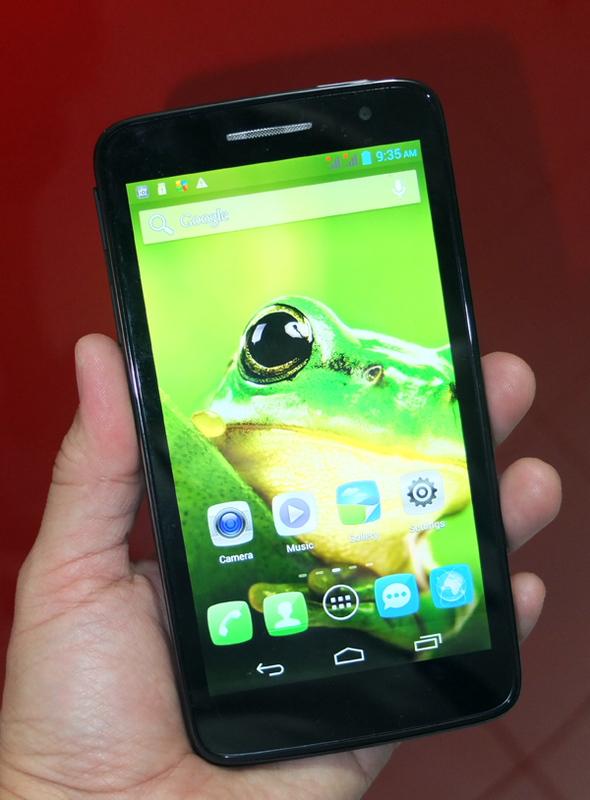 Another Alcatel contender in the looks department is the Alcatel One Touch Scribe HD. It has almost similar feel and built with the One Touch Idol Ultra, except that it is a bit thicker, features a 5 inch HD screen, a 3.5 mm headphone jack, and a a dual micro SIM slots (located on the left side of the device). 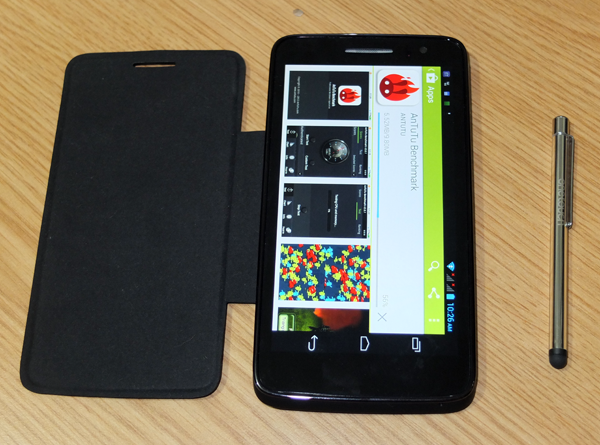 It runs on Android Jellybean 4.1 and powered by a quadcore ARMv7 processor. 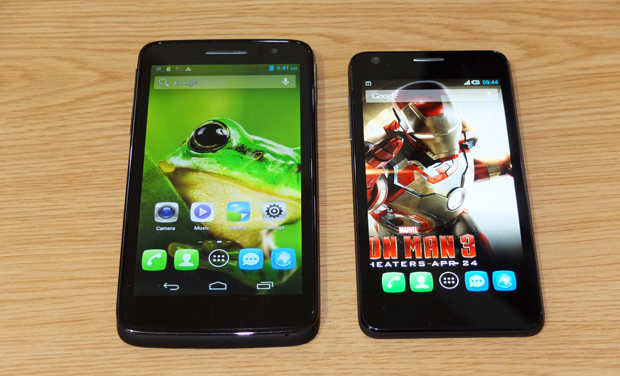 By the way, multi-core processors are fast becoming standard in 3G smartphones. By the bigness of its screen, the One Touch Scribe HD is more positioned as a “phablet” and for this design usage, Alcatel provided freebies—a magnetic MagicFlip and a touch pen. The MagciFlip cover attaches to the back of the device, making the device, with its additional pen, look like a Galaxy Note. The touchpen doesn’t have a pointed tip but rather a rubber ball. This is similar to touch stylus accessory sold at accessories stores to replicate the sensation of finger touch with a pen. The “pen” is most useful if you want to use the device for note taking, drawing, or photo editing. Similar to the One Touch Idol Ultra, the One Touch Scribe HD features an 8 megapixel camera with autofocus and LED flash. It can record and playback HD video at 1080p resolution. An extra is the fortified glass of the screen. Though not a Corning Gorilla, the Dragontrail extra hard glass for the screen features oil and fingerprint proofing. Internal storage capacity is 4GB which can be expanded through a micro SD slot that can support up to 32 GB more. 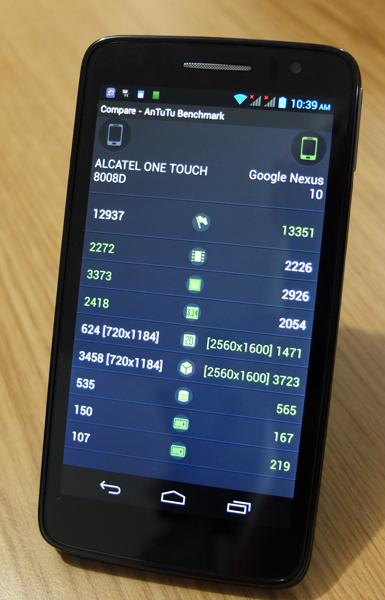 We’ve run AnTuTu benchmarks tests on the two smartphones. 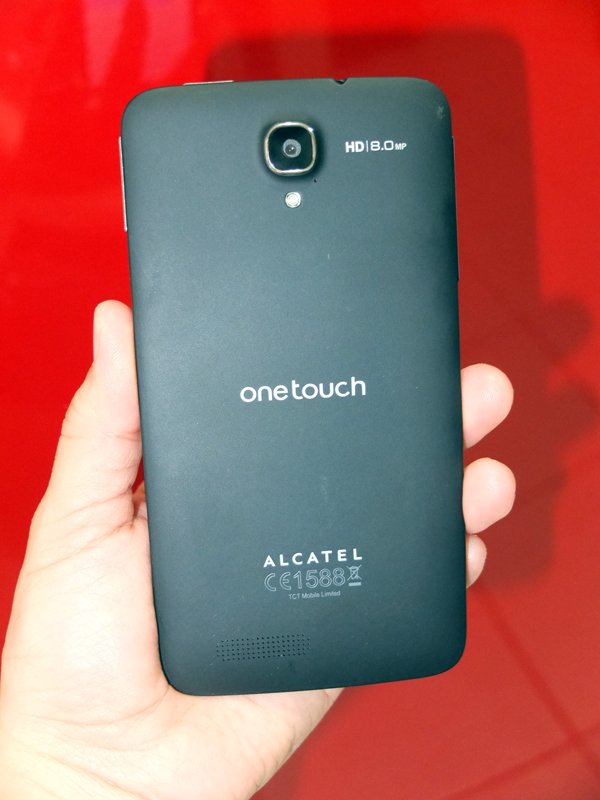 The quad-core powered Alcatel One Touch Scribe HD got a four and half stars registering 12937 points. Its score is comparable with the AnTuTu benchmark scores for Google Nexus 7 and near the score of HTC One X. 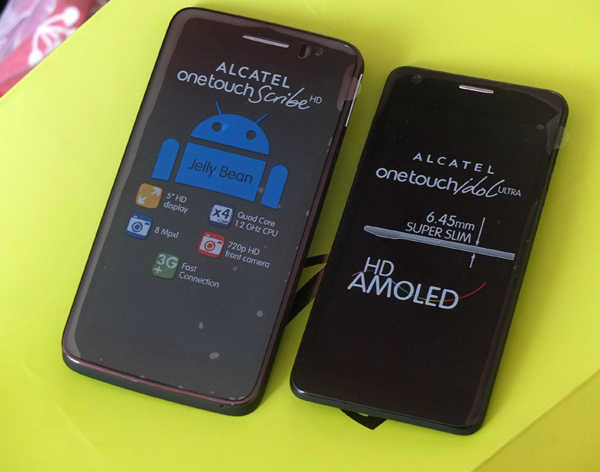 The dual core powered Alcatel One Touch Idol Ultra only got three stars registering a total of 6115 points. Its score is comparable with benchmark score for Samsung Galaxy Nexus. 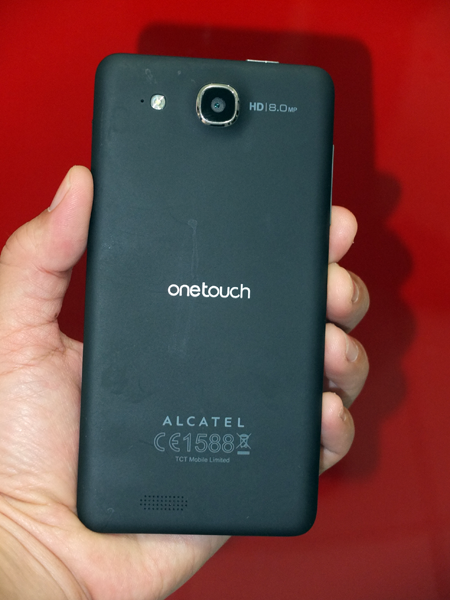 SRP for Alcatel One Touch Idol Ultra is P14,990. 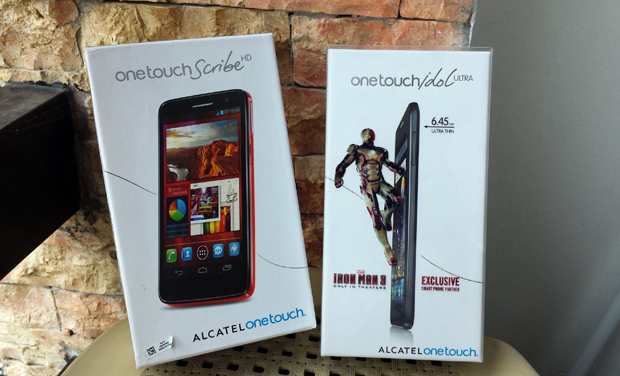 SRP for Alcatel One Touch Scribe HD is P13,490. Check out the poster below as the Alcatel One Touch Idol Ultra will be on discounted sale, up to P1,500 discount, on June 1.